In the run up to Evidence Live 2016, we are running a series of blogs by the conference speakers discussing what they will be talking about at the conference. The main job is to care for the patient. Evidence based medicine makes use of an adjectival phrase, “evidence based,” to note that this is a form of special medical practice, but still it is medicine, it is care. The adjective that modifies this noun, and the verb—to care—it implies, signals the importance of considering the scientific basis of our practice, and the need to use evidence judiciously in the care of patients. This was an important development, maturing in the early 90s when the idea and the term, coined by Gordon Guyatt, came into use. The term, and the practice, influenced my late medical training, and have been fundamental in my first two decades at the honorable place of the patient’s bedside. Change funding models for clinical trials to create a firewall between for profit interests and the researchers. Expand the evidence synthesis enterprise, to search for the available evidence (even in obscure sources), appraise it for bias and spin, remediate to the extent possible reporting and publication bias, and identify new knowledge gaps. Promote the measurement of important outcomes for patients, placing a high value on validity, ease of interpretation, and relevance to patients and a lower value on saving research resources by using surrogate markers of uncertain validity. Promote methodological research to generate empirical evidence of bias associated with different research approaches (e.g. stopping trials early for apparent benefit), identify best strategies to detect potential for bias and spin, and to ameliorate the effect of spin on trial conclusions. Enforce the prospective registration of clinical trials and clinical trial protocols to detect and minimize reporting and publication biases. Promote the training of new scientists in the conduct of rigorous research with a focus on producing results that will make a difference in practice. Promote rigorous, complete, and open reporting of research results according to state-of-the-art standards. Production of evidence summaries and guidelines free of commercial and personal conflict of interest. At the time, I was talking about the End of Evidence-based medicine on the basis of the corruption of the evidence that could be used in practice, and the lack of any practical means of truly engaging patients to fully consider their values, informed preferences, and circumstances. It is in this regard that we must return to the noun and to place things where they belong. Because the evidence cannot care for people, we must make it care, or more practically, we must find a way of helping us care for the patient. This is the whole purpose of evidence-based medicine. This task may be successfully accomplished by considering the situation of the patient, and the aspect or aspects of it that are judged at this point to require action. It is important to be explicit about this selection. Why are we acting on this aspect of the situation and not another? Is it in the best interest of the patient or are there factors of ease, availability or incentives that draw our eyes toward a particular aspect? Why are we focused on the patient’s marker of glycemic control instead of focusing on their quality of life? Afterwards, we must discover the available options that may represent appropriate action for the situation. It is a crucial task to become aware and make patients aware when those options are available, when a decision is possible. We must consider then how each of these options adequately addresses the situation of the patient. The best way we have found to do this is through a conversation. Each option is a hypothesis, tested in thought experiments in conversation. In these experiments, clinician and patient work together to imagine the impact, favorable and unfavorable, each pertinent option could have over the patient situation. Medicine practiced in this way is not easy. It takes deliberate practice and expertise. It requires clinical curiosity and generosity, and a great deal of compassion, empathy, and humanity. And in doing all these, we must not punish patient with the heavy burden of our arrogant knowledge. Rather, we must care. I have been to visits with patients as a family member or as a caregiver, in which I was recognized as that “evidence-based medicine guy” and was bludgeoned with data, abused with citations, and showered with graphs while we looked perplexed at the display. The doctor seemed pleased. The sick or the EBM guy? Not so much. I have supervised trainees that know the guideline recommendation but have no clue about the underlying evidence, its credibility and its applicability to the situation of this patient. I have read articles and heard lectures in which “evidence-based” is code for “don’t think otherwise.” This is not careful. This is not kind. This is not care. And therefore, it is not evidence-based medicine. The job of caring must rise above the knowing and spewing the literature or the plain recitation of guidelines, no matter how evidence-based they say they are or how much easier they make our lives. We must care, and to care, we must help resolve the situation of the patient, identifying what is best for this patient and for his family, not what makes our quality parameters look better or improves our income. The process is best when it explicitly accounts for what we know (and ignore) and the degree of trustworthiness that the body of pertinent literature merits, not when we refer to the latest paper or recommendation without appreciating their value or when we practice in an evidence vacuum or under the tyranny of evidence, i.e. the immediate application of the results of a highly publicized trial. Thus, practices like shared decision making that satisfy themselves in sharing information with patients or in asking them to make choices, fall short of the ideal of EBM. Carefully considering the situation and how best to resolve it in a manner that reflects what patient’s value and the science of medicine better describes the job. Evidence does not care. But, that is the job: it is to care. In doing so, we must be careful and we must be kind. The rest are important adjectives. 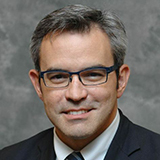 Victor Montori is professor of Medicine at Mayo Clinic. He is a practising endocrinologist, researcher, and author, and also a recognized expert in evidence-based medicine and shared decision-making. He developed the concept of minimally disruptive medicine and works to advance person-centered care for patients with diabetes and other chronic conditions. Victor Montori will be speaking on Transforming the Communication of Evidence for Better Health on 22 June at Evidence Live 2016. William Cayley: Whither the communication of evidence in the social media world?